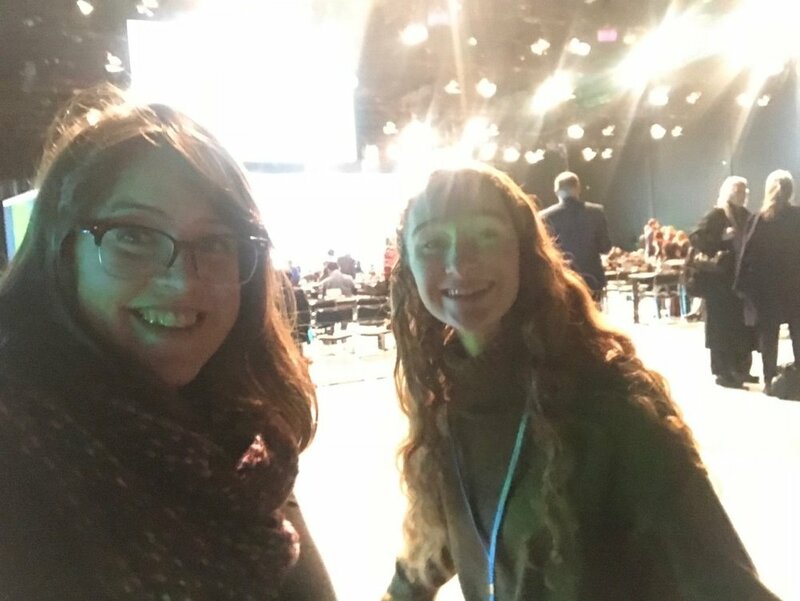 As Grace mentioned in her blog post earlier this week, equity and justice have been key themes running through both the negotiations and the side events here in Katowice. However, these two formats seem to be headed in very different directions. Side events are usually panels, put together by governments, non-governmental organizations, non-profits, and universities, around topics tangential to climate change, such as energy, water, agriculture, public health, or transportation. Most speakers that I have seen in these panels have been clear that we need to act quickly and decisively to address climate change. They also stress that we must keep at the forefront of our planning that the least privileged people are often the ones most affected by the effects of climate change. On Tuesday evening, several Tufts delegates attended a panel addressing climate-forced displacement. Speakers addressed displacement for the people of Tuvalu and indigenous communities in Alaska, then connected this to the discussion on displacement happening within the formal negotiations. Robin Bronen, Executive Director of the Alaska Institute for Justice, pointed out that our actions and consumption are directly responsible for this displacement and loss of home and culture for indigenous peoples in Alaska. Her organization works directly with indigenous communities on strategies for building community-led relocation plans. While Bronen was able to give the audience some hope that change was possible, Harjeet Singh of ActionAid International pointed out that, not only is equity not a priority for negotiators of the Paris Rulebook in Katowice, but many country delegates have actively tried to change the committee structure to avoid having issues of equity and displacement come up at all. Tufts delegates at a meeting of the APA. Tufts delegates also attended a meeting of the Ad-hoc Working Group on the Paris Agreement (APA) checking in on progress towards five of the agenda items for COP 24. Many parties in attendance expressed concern that issues of equity and CBDR (“common but differentiated responsibility”), a key part of the Paris Agreement, were being deleted from the text for many of the agenda items. A key piece of the Rulebook is that it should address Loss and Damages, the idea that small, poor countries hit by climate-induced natural disasters will not only lose capacity and economic resources, but will be facing enormous losses of life. Unfortunately, this workstream is profoundly under-financed and draft text from the Loss and Damages subcommittee this week does not adequately address the urgent need for financing from developed countries. APA co-chair Jo Tyndell presides over a check-in meeting on progress towards the Paris Rulebook. One area where the official UNFCCC process has tried to be more inclusive and proactive in addressing equity is in the Talanoa Dialogue. Talanoa is a style of negotiation through storytelling from Fiji, the sponsors of last year’s COP. Hundreds of Talanoa events have taken place in the last year to collect stories from people directly affected by climate change and to share strategies that communities around the work are already taking to address climate impacts in their area. The hope is that, by sharing the stories of real people affected by the impacts of climate change, politicians and negotiators will remember the real impacts of inaction or a lack of ambition. I hope that the negotiators remember that our ultimate goals are a better life for every person on Earth, and these negotiations must recognize that the impacts of climate change will impact us very differently.